The silver essay pictures above are present on the site through the kind permission of Mr. Florin L.. The content of precious metal assures for this coin-medal a nominal value of 5 or maybe 6 gold ducats. The replica was struck in 250 pieces. The original pieces are very rare, only a few known. An original coin can be seen here. The coin belongs to the "History of Coin" series. Two other replicas were struck from the same series: gold koson and gold 20 lei from 1868. Constantin Brâncoveanu was represented also on the aluminum circulation coin of 1000 lei struck from 2000 to 2004 (for the mint sets, from 2000 to 2006). Voivod Brâncoveanu wears on the head a cap adorned with a plume, being dressed up with a coat embroidered with gold and silver threads. Over the coat he wears a princely mantle with ermine collar, fastened with a hook and eye. The rosette that fastens the panache and the hook and eye on the mantle are struck with gems. Coat of arms of Walachia: oval shield with pearl border, inside an eagle to the right (to the left, heraldic positioning), with cross in its beak, with spread wings and with the head turned to the left (to the right, heraldic positioning), sitting on a mountain peak; at left the sun and at right the moon. Around the shield are adornments with griffins (?) coiled in spirals. Atop the shield is a princely crown. Inside the adornments below the shield are placed the letters C and H, unanimously considerated to be the initials of the engraver. 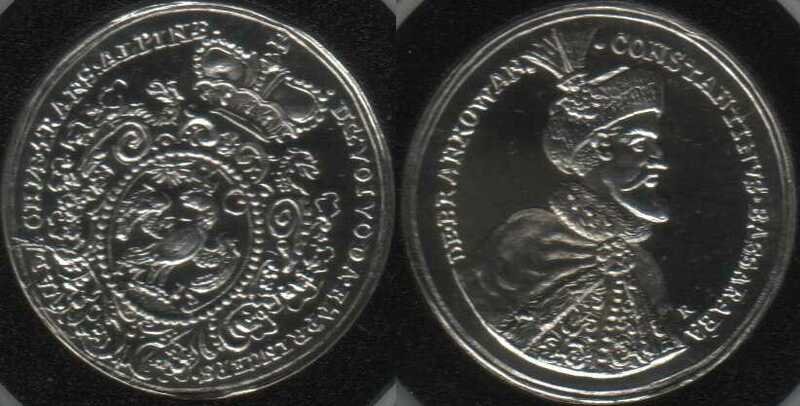 In MBR and in the coin pamphlet, CH means Carol Iosif Hoffman, artist that created medals at Alba Iulia (one of the oldest towns in Transylvania, named Apulum in the Roman times) between 1713 and 1738. In the book Numismatica medievală şi modernă (Medieval and Modern Numismatics) from 1942, Corneliu Secăşanu - well-known Romanian numismatist, secretary of the Romanian Numismatic Society - considered that the letters C H stand for Carol Iohan Hedlinger, also from Alba Iulia. We quote below three paragraphs from the Chronicle of the Romanians (work finished in 1811, forbidden by the censorship of the Great Principality of Transylvania's Government, printed entirely after more than half a century in Romania) by Romanian historian Gheorghe Şincai. The text belongs to the chapter dedicated to the year 1713 and refers directly to the gold coins struck by voivod Brâncoveanu. And Delchiaro writes "[...] the indictments that were sent to the Turkish Porte on prince Brâncovan were these [...] 10. That he had golden coins struck in Transylvania, of 2 and also of several galbeni [galben means, besides color yellow, a golden coin in Romanian], even of 10 galbeni, of which one is sent to the Sultan, to a better ascertaining, and the other coins will be found in his private treasury, with many gemstones, that cannot be priced, when Brâncovan will be overthrown. Why for did Brâncovan allow these coins to be made, many people have many explanations, but altogether they say that in the day of Saint Mary's Dormition of year 1714, when he would have entered his 60th year of his age and the 26th of his rule, he wished to give a very wonderful feast to all his boyars and at the end of the feast he wanted to allot these coins to every boyar, after his rank or official position held; but wow and wretched! in that very day his four sons and him were cut down." About those gold coins of, so does Samoil Chéleşeri write: „For the family remembrance galbeni of ten and five had recently been struck by the prince of Walachia, that on one side had his countenance, after the custom of the Romanians, embellished with an expensive mitre on the head and with mantle hanging of the shoulders, and around with this inscription: "Constantinus Besaraba de Brâncovan", on the other side had the coat of arms or the blazon of Walachia used by the princes for the political affairs, because in the Church affairs they use a seal, with Saints Constantine and Helena engraved, holding the cross in the hands. Under the princely mitre, in the shield there was a raven with spread wings, holding an regular cross with the beak and standing on a part of a tree branch and above at one side the sun, at the other side the moon, with the inscription "D.G. Vaivoda et Princeps Valachiae Transalpinae" around. This coin unfortunate brought doom on Brancovanian family, after the prince fell with his in the hands of the Turks." Anton Maria Del Chiaro, italian from Florence, has been the secretary of Constantin Brâncoveanu. The informations used by Şincai are taken from book "Istoria delle moderne rivoluzioni della Valachia" (History of Modern Revolutions of Walachia), written by the Italian and printed in Venice in 1718. The other book cited by Şincai is Auraria Romano-Dacica (work about the gold-mining in Transylvania), written by Samuel Köleséri de Keres-éer and printed in Sibiu in 1717.